As far as we know we at CTEC is the only reputable dealer that still does ink cartridge refilling in Bloemfontein. Our ink cartridge refills are done by our technicians and if you stand at the window you can actually watch while the technician refills your cartridge. We have been in business for about 11 years and during this time we have built up a reputation of dependable customer service. Therefore we would rather tell you that your ink cartridge cannot be refilled than having an unhappy customer. We are always looking for ways where we can help our customers save money. So if we can not refill the ink cartridge we can always convince you to try out our trusty compatible ink cartridges. These cartridges we can also refill for you should your cartridge become empty. How Many Times can I Refill my Printer Cartridge? This is the biggest and the most important question that need answering. Usually you can refill a cartridge between 4-6 times if you adhere to all the instructions on how to treat your ink cartridge. Unfortunately, as with toners the ink cartridge can’t last forever. Circuits and nozzles wear out eventually. We can tell you precisely what you can do to preserve the life of your printer cartridge. There is also plenty of online information available on what to do and what not to do when it comes to treating, installing and uninstalling your printer cartridges. At CTEC we stock the correct inks for your type of printer. When refilling we ensure that your cartridge receive the correct amount of ink. All cartridges are tested after refill to make sure that correct quality is achieved. Never let your ink cartridge run dry as it may cause the nozzles of the cartridge to dry. Although we at CTEC have the equipment to clean the nozzles it is not always successful. So we believe that prevention is better than cure. Never try to print with a ink cartridge when it is dry. This is called dry firing. 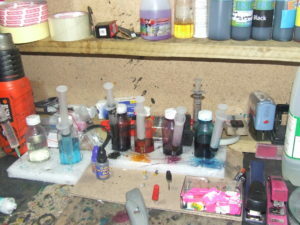 Through this process the crystallization of ink in the nozzle can take place. When you take the cartridge out of the packaging make sure that you handle it with care. Do not to touch the print head or the flex pads on the copper circuitry at the rear of your cartridge. If the flex pads are damaged there is nothing anyone can do to restore them. At CTEC you can buy refill kits as well to fill your own ink cartridges. We suggest that you first bring yourself up to speed with how your machine operates and the treatment of cartridges, before trying this option.However, we recommend that you rather make use of our risk free ink refill service.